We are exhibiting at The Newport Antiques Show from July 25 – 27, 2014. The exhibition takes place at the St. George’s School in Middletown, Rhode Island. On display will be a great selection of 19th, 20th and 21st century works on display; included will be paintings by: Eugene Boudin, John Stobart, Montague Dawson, William Suys, Louis Aston Knight, Daniel Ridgway Knight, Alonso-Perez, Edouard Cortes, Antoine Blanchard, Abbott Fuller Graves, Erik Koeppel, Timothy Jahn, Todd Casey and many others. Below is a link to a ticket that will give you $3.00 off the General Admission price. I do not have a wall that will do the work justice! Really? Do you live in a tent? I cannot pay you $8,000 for that painting … would you take $1,000? My reply cannot be posted here! Look, if a work of art is out of your comfort zone, that is ok; but what is not ok is to insult a dealer with an offer like that. If the dealer could actually sell a work that was priced at $8,000 for $1,000 does it have any real value? Probably not! We are now halfway through the year and the market appears to be moving higher -- ever so slowly. The opening number on June 2 was 16,717 and at the end of the month we were at 16,826; in addition, during the 21 trading days we stayed in a fairly tight trading range – 16,673 to 16,978. From the initial look of things, all seemed good. This evening, June 30th, I studied my overall portfolio and noted that while almost all of my stocks are still in the black, each individual investment is trending lower! This is really getting annoying --- each month the Dow edges up and my stocks edge down … I do not like this trend. What is happening???? Anyway, here are some of the specifics: JP Morgan ($57.62 - up), Emerson ($66.36 - down), Exxon ($100.68 - up), GE ($26.28 - down), AT&T ($35.36 – down), VOD ($33.39 - down), Verizon ($48.93 - down), Wal-Mart ($75.07 - down), Coke ($42.36 - up) and DuPont ($65.44 - down). Oh, I added a new stock to the group – JD.COM … bought at $25.46 and it now sits at $28.51 (not bad for 1 month). Knoedler – The hits just keep on coming. It was recently revealed that ‘fake’ Jackson Pollock paintings that Rosales supplied to Knoedler, in fact, had a misspelled signature. Instead of Pollock, it was signed Pollok (missing the letter ‘c’). Now to be fair, I have to say that over the years I have seen genuine paintings by artists where the signatures were missing a letter; but in the case of a $280,000 piece, this should have raised a red flag. Even more interesting is the fact that this particular piece was purchased by the former president of Knoedler, Ann Freedman, for her personal collection. Rosales – One of the individuals involved in the Knoedler scandal was supposed to be sentenced in March, but that has been postponed until September. On March 14 her attorney filed a secret document with the Manhattan federal court – uh oh! This is getting even more interesting. Patrick Rooney – This 55 year old Colchester, Vermont, resident was charged, back in January, with stealing a 223 year old document from the Fletcher Free Library and trying to sell it to the University of Vermont’s Bailey-Howe Library for $175 (yes, that is correct … $175). To top it all off, Mr. Rooney was found dead in February … the victim of an apparent suicide. Humm … killing yourself over $175? That seems pretty odd to me. Well, now it appears that he was also being investigated for his involvement in more than 200 other stolen documents. There are going to be a lot of unhappy purchasers! Recently, all we have been hearing about is which collectable just set a new auction record…we’ve been blown away these past few months with astounding new records for artwork sold at auction, but paintings are not the only items setting impressive new auction records. Here are just a few interesting items that have just made history. At a recent sale, a Chinese Hand Scroll, c. 1900, set a new auction record when it sold for $4.1M (est. $10,000 -20,000)…nice price!! The entire sale made $6.86M on a presale estimate of $1.6 - $2.4M, so the scroll accounted for nearly 60% of the sale’s proceeds. Another remarkable result was realized for American art pottery when a 17 ½ inch tall baluster-form vase, incised with a detailed peacock, by Frederick Hurten Rhead (1880 – 1942) sold for $570,000 (est. $70,000 – 90,000). The vase was made during Rhead’s brief tenure at the University City Pottery in University City, MO. In addition to its rarity, a complete provenance accompanied this lot. It was purchased in 1910 by a couple who gave it as a wedding anniversary/baby gift to a family in Iowa City and was then handed down through the generations. It was recently discovered when one of the heirs was cleaning out his home. The battle was fast and furious until it came down to three competitors. In the end, the winner, who had dropped out early in the bidding, came back just in time to win. It is believed that the vase will be part of the collection at The Museum of the American Arts and Crafts, St. Petersburg, FL, which is scheduled to open in 2017. This museum is dedicated to preserving the legacy of American Arts and Crafts…the first of its kind…Really!! A specialty auction for childhood items made news when an antique doll made by Albert Marque (1872 – 1939), a French sculptor and doll maker, was sold. The auction featured 1,000 pieces from the Puppenmuseum Stein am Rhein, a world renowned doll museum in Switzerland. This Albert Marque bebe (c. 1915), has long been considered one of the most sought after and highly collectable dolls. Marquet was influenced by the Parisian couture fashion house of Jeanne Margaine-Lacroix to sculpt 100 dolls, each dressed in custom-made outfits created by Margaine-Lacroix. They were exhibited in Paris at the fashion house and the unsold dolls were kept by Margaine-Lacroix for inventory. The dolls were representations of French royalty and peasantry which celebrated France and its culture; they were created as a response to the popularity of mass-produced German dolls during WWI. This particular doll was wearing an original (signed) Tyrolean costume and inscribed on the head with #27 (of the 100). After some fast and furious bidding among passionate phone and floor bidders, the final record setting bid of $300,000 was cast; the voice of the auctioneer was quickly replaced by the sound of applause. And the last little gem for this month is a pendant featuring a pair of natural pearls, said to once belong to Empress Eugenie, that sold for $3.3 million (est. $100,000-200,000), which surpassed the previous record by $900,000! The drop-shaped pearls were mounted in antique silver and diamond caps and set into a c.1920 platinum and diamond ribbon-like pendant that included 23 diamonds with an approximate weight of 2.0 cts. Accompanying the pearls was a report from the Swiss Gemological Institute stating that they were saltwater natural, with no indication of artificial color modification, as well as uncharacteristically adding to the report, Exceptional Pair of Natural Pearls…[the pair of pearls] possesses extraordinary characteristics and merits special mention and appreciation. Really!! In addition, a notation in the lot description stated: In 1887, following the fall of Napoleon III and his wife, Empress Eugenie, an historic auction of the French Crown Jewels took place in the Louvre, lasting twelve days, the New York firm of Tiffany & Co. was the largest purchaser at the sale, successfully buying almost a third of the crown jewels. So is it the impressive provenance that brought these incredible prices or the pieces themselves?? Maybe you need a little bit of both! Really!!! Well, after the intense action that took place in New York last month we would have all liked a break ... but that did not happen. The month of June was as busy as ever and most of the public action was in London. Not only were there dozens of art auctions, but there were many art fairs --- so the amount of product hitting the market was pretty amazing. On top of all that, Art Basel took place in Switzerland and reports from there were just mind boggling --- a Warhol sold for over $30M, a Jeff Koons for more than $5M, a Joan Mitchell brought $1.5M, a Bruce Nauman at $3.2m, Georg Baselitz - $3M, Richard Prince - $2.2M and the hits just kept on coming, I really think certain segments of the art market are turning into a circus … and to prove that point, one Art Basel dealer reportedly threw a party honoring the German artist Gunther Uecker (the artist’s suite of 8 white paintings sold for $5M Euros). During dinner her guests were entertained by sword swallowers, a human cannon and two burlesque acrobats! Both Sotheby’s and Christie’s unveiled their top American works at the end of May, leading to strong sell through rates and strong realized prices. At Sotheby’s, half of the top ten lots were by Norman Rockwell (in fact, there were 10 Rockwell’s sold in the sale and together they totaled $20M). After the Prom, painted in 1957, is one of Rockwell’s most recognizable works featuring two teenagers seated at a diner counter admiring each other after their Junior High prom. This painting was originally given to Rockwell’s son, Thomas, and it is believed that the spark of inspiration for this work was Thomas marrying his high school sweetheart. Previously auctioned back in 1995 when it made $880,000, After the Prom (which was the cover of the sale’s catalogue and the May 25, 1957, edition of The Saturday Evening Post) brought $9.13M (estimate $8M - $12M), making this the most expensive work in the sale. The second highest sold lot was Milton Avery’s March and Sally Outdoors, 1950, which featured the artist’s two most important muses -- his wife and daughter. This work was bought by the seller’s mother directly from Avery and has remained unknown to the public and experts until now. With an estimate of $2M - $3M, March and Sally Outdoors garnered $5.7M … an auction record for the artist. In third place we had a tie: Rockwell’s Boys and Girls First Aid Week (Scout Bandaging Girl’s Finger) 1962, (estimate $1-$1.5M) and Georgia O’Keeffe’s Lake George Barn, from 1929 (est. $2.5-$3.5M) which is one of fourteen works that O’Keeffe painted on the Stieglitz property and had been in the same collection since 1988. Both works brought $2.97M. Running down the rest of the top ten lots we find that Albert Bierstadt’s Yosemite Valley (1865) brought in $2.5M (est. $1-$1.5M). Three Rockwell’s followed, the first of which was Willie Gillis on Convoy (cover of The Saturday Evening Post on October 4, 1941). In this work, Willie sits facing us in the back of the army truck -- Rockwell would paint 11 Post covers featuring the soldier and his adventures serving in the Second World War (one of which was offered at Christie’s the following day, Willie Gillis in Church, but that one did not sell). The painting was gifted by Rockwell to the seller, the Gardner High School, in 1951, and it sold for $2.3M (est. $1.5-$2.5M). Next came The Ouija Board (1920), selling at $1.69M … just over its high estimate of $1.5M. This was followed by, If Your Eyesight Controls Your “Great Decisions,” from 1929. This Saturday Evening Post cover of December 14, 1929 was commissioned as an advertising campaign for the Tillyer Lenses Company’s new wide-angle lenses. The work depicts two elderly men playing cards, the man on the left is wearing glasses and smiles as his ace lay on the table, to the right is a man without glasses squinting at his cards. Estimated to bring $400-$600K, thet work blew past that and sold for $1.33M. Finally, Edward Hopper’s House on the Shore, from 1924, doubled its high estimate of $500K, bringing in over $1M; while Milton Avery’s Dancing Trees from 1953 brought just above the low estimate of $1M at $1.03M. In the end, the sale made well $45.87M (falling comfortably within its pre-sale estimate of $33.2-$49.7M), the highest total in the last five years. 80.7% of the lots sold, making this the fifth consecutive year that Sotheby’s American sale sold over 80% of the lots. Ten lots sold over $1M with half of the sold lots making above their high estimates. The following day Christie’s held their sale and Norman Rockwell topped the charts again when The Rookie, The Saturday Evening Post cover from March 2, 1957, grabbed the top spot. Iconography of America in the 20th century was always the heart of Rockwell’s subjects, so it comes to no surprise that he would paint one of America’s oldest and most beloved baseball teams, the Boston Red Sox (Go Yanks!). The Rookie made $22.6M, just above the low estimate of $20M, making it the second highest price for the artist at auction. Next we had a very strong result for The Grand Canyon of the Colorado -- what some consider a masterwork by Thomas Moran. Here, the artist paints his favorite subject, the Grand Canyon, with a strong play on light and shadow. Captured from a high vantage point, you are looking down on the peaks and divots of the canyon which dwarf the sliver of the Colorado River in the distance. Last sold by Sotheby’s in 1990 for $1M, 24 years later it brought $12.5M (est. $8-$12M) --- making it the second highest lot in the sale. Anchors, by Stuart Davis, is an iconic 1930’s piece depicting recognizable objects and elements of Gloucester, MA. The catalogue details a lengthy provenance for this work, coming to auction twice prior; first in 1987 at Sotheby’s, selling for $220K, and again in 2002 at Christie’s for $780K. This time around, Anchors sold for $1.8M (est. $1.5-$2.5M). In fourth, we found Edward Hopper’s Coast Guard Boat I. First purchased by Robert W. Huntington eighty-nine years ago, the work has remained in the family’s possession ever since and was finally sold for $1.7M (est. $1-$1.5M). Rounding out the rest of the top ten we had: Milton Avery’s 1946/47 work, Siesta at $1.57M (est. $1-$1.5M); followed closely by his The Mandolin Player, from the same period, which sold for $1.46M (est. $800K-$1.2M). Then we come back to Norman Rockwell, who many believe was the greatest visual mass communicator of the twentieth century. The Franklin Mint, founded in 1964, was yet another company hoping Rockwell’s “Americana” artwork could help them bring art and collectables to the masses. Their relationship started 1970, when Rockwell began the first stages of his commission for The Mint. The theme: to celebrate the connoisseurship of The Mints most loyal customer, the coin collector. Over the next five years, Rockwell created about 80 sketches for works that were planned to be made into collectable plates, medals and figures. Two oil paintings were then commissioned to be reproduced and sold as limited edition lithographs. Both original works were being offered by The Franklin Mint at the sale. The first, Spirit of America, 1974, made $1.1M --- more than twice the high estimate of $500K. The second, The Collector, 1971, had an estimate of $700K - $1M and brought in $965K. Here we find an avid collector studying a coin in his white gloved hand, the other is equipped with a magnifying glass for detailed inspection. An important element in the scene is the bust of Benjamin Franklin, the namesake of The Mint. The final two works that topped the charts were Winslow Homer’s, A Shady Spot, Houghton Farm and Francis A. Silva, October on the Hudson. The Homer was last on the market in 2002 and sold for $493K, this time it brought $965K (est. $600-$800K). Silva’s painting, circa 1873, sold for $941K (just under the top end of its estimate - $1M). This same painting was last seen on the market in 1993 when is sold for $102K (est. $100-$150K). Once the sale was over, of the 167 works offered, 115 found buyers (69%) and the total take was $64M. Between the two salerooms over $100M worth of American art changed hands in the course of 2 days … not bad! Towards the middle of the month Christie’s held their Victorian & British Impressionist sale … and all eyes were on the William Holman Hunt that the Delaware Art Museum was selling (there had been a lot of press about the sale of the museum’s works to pay down a $20M debt --- not something they are supposed to do). Anyway, the day of reckoning came and while the work sold, it did so at a level far less than was expected. The painting – Isabella and the Pot of Basel – was a good looking work; however, the £5-8M estimate did seem a little high for such a small painting (24 x 15 inches). In the end, a very lucky buyer picked it up for a mere £2.5M (£2.88M with commissions --- $4.9M). I should add that it was the most expensive piece in the sale and an auction record for the artist. Taking the number two spot was a pretty Tissot titled Waiting that carried a £500-800K estimate and sold for £800K (£963K with commission - $1.63M) and in third was Rossetti’s Rosa Triplex which was estimated at £700-1M and sold for £750K (£903K with commissions -- $1.5M). Rounding out the top five were two works by Edward Lear: Jerusalem looking North West at £570K (£687K with commissions -- $1.16M) and View of Florence from Villa Petraja at £550K (663K with commissions -- $1.12M). It was nice to see that most of the more expensive works found buyers; however, as with all sales, there were a few big ticket works that went unsold … and they were: Millais’ Master Freeman (est. £250-350K), Arthur Hughes’ The Home Quartette (est. £150-200K) and Munnings’ Going to the Start (est. £100-150K) --- and from the catalog images, it looked like they were going to be tough ones to sell. 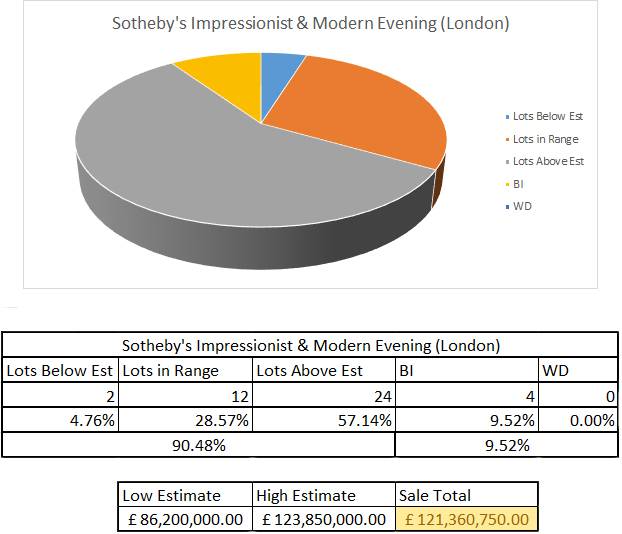 By the end of the session, of the 141 works offered 108 sold (77% --- which stronger than the New York 19th century sales, but this was highlighting only British art) and the total take was £10.1M ($17.2M) … the low end of their presale estimate range was about £8M. As we have seen with many of the recent sales, it is all about the top works being offered and in this sale, the top 10 works accounted for 74% of the total take, or £7.5M ($12.7M). Not a bad way to end the season for the 19th century works. As the month came to a close, Sotheby’s and Christie’s held their series of Impressionist and Modern sales in London. With the day sales and works on paper sales being rather… “Ho-hum, nothing to write home about,” we typically turn to the evening sales to gauge the health of the market, but these results could not be more disparate. The week started off with Sotheby’s Evening sale on Monday night and things got rolling quickly; by the time they hit their first unsold lot (18), the top three lots had already sold. Leading the way (far far away), was Monet’s iconic Nympheas (1906), bringing over £31M ($54M) on a £20-30M estimate. In fact, this was the second highest price ever paid for Monet’s work at auction – though well behind his record of $80.5 million, which was paid for Le Bassin aux Nympheas (1919) back in 2008. Taking second was a Mondrian, Composition with Red, Blue and Grey from 1927, which sold for £15.2M ($25.9M) -- it was expected to bring between £13-18M. This particular work has never been sold at auction and achieved the second highest price ever paid for a work by the artist at auction. Rounding out the top three was another Monet, La Seine a Argenteuil, painted in 1875, just a year before his wife Camille became gravely ill. The work ended up selling for £8.5M ($14.5M) on a £7-10M estimate. The sale, as a whole, went incredibly well -- 42 of the 46 (91.3%) found buyers while sale’s total of £121.9M nearly surpassed the presale estimate of £86.2-123.9M. Sotheby’s day sale on Tuesday was mediocre at best with the top three lots (out of 354) reaching a combined total of just £2.5M. These included a Chagall, a Schiele, and Renoir’s Femme allongee; the latter of which was the only work to eclipse the £1M mark (barely - £1.022M/$1.74M), although it was only estimated to bring £500-700K. Chagall,s Les tulipes, which took second, had remained in a private Swiss collection for over 30 years and sold for £638K (Est. £350-450K - $1.087M) while a pencil on paper by Egon Schiele nabbed third at £578K ($923K) on a £200-300K estimate. With a lot of help from the buyer’s commission, the sale’s total squeaked it into the presale estimate range although over 100 lots failed to sell; the 247 sold lots (69.8%) totaled £23.1M ($39.4M – est. £22.4-31.7M). Now we can move to the other side of the coin which can only be described as disappointing. 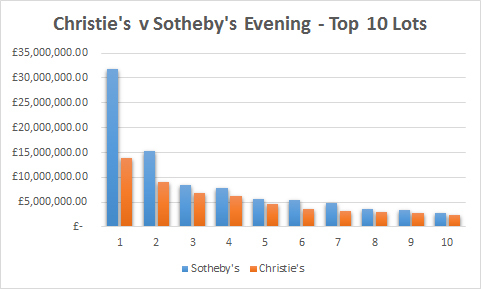 Christie’s evening sale offered more lots, sold less work, and failed to scratch the surface of their presale estimate range (even with premiums added in). The top lot of the night was Kurt Schwitters’ Ja – Was? –Bild, more than doubling its estimate of £4-6M when it sold for £13.9M ($23.7M), which is a new record price for a work by the artist at auction (previous record was only £1.3M). Second went to a Giacometti which featured an incredibly rare golden patina and is part of the renowned series of 9 sculptures known as the Femmes de Venise. The sculpture was estimated to bring £8-12M and sold for just over £9M ($15.3M). L’artiste et la modele nu by Henri Matisse took the third spot when it realized £6.8M ($11.5M – est. £7-10M). This work, painted during Matisse’s early years in Nice, has been featured in almost every major exhibition of the artist’s work in the last few decades. Even more interesting was the failure of the catalog’s cover piece, Giacometti’s La Main, which carried a £10-15M ($17-25M) estimate; this had a significant impact on the final numbers. 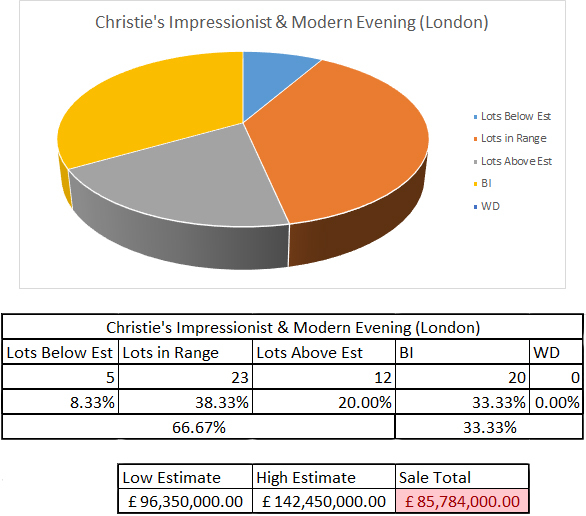 As I noted earlier, the results were pretty poor… only 40 of the 60 works sold (66.6%) and the total with premiums yielded just £85.7M, quite a bit short of the £96.4-141.4M presale estimate. We’ll wrap this up with the Works on Paper and Day sales which took place on Wednesday (results are combined). The top lot of the day was Giacometti’s Table grecque rectangulaire, which to me, simply put, looked like a very, I mean very, expensive coffee table. The bronze table, conceived in 1965, was estimated to bring between £120-180K but ended up realizing just over £650K ($1.1M – Damn it Timmy, how many times do I have to tell you to use a coaster!). Taking second was a work on paper by Oskar Schlemmer, bringing £548K ($931K) on an estimate of £200-300K. A Renoir took third, Paysage du Midi, selling for £542K ($920K) on a £480-700K estimate. Again, the overall results were just “middle of the road” -- typical of the day sales. Of the 243 works were offered, 185 sold (76%) and the total take was £22.8M ($38.7M – Est. £19.1-28.3M); they too needed those premiums to sneak them into their presale estimate range. People are always interested in knowing how each individual market is holding up and it is really difficult to use the results from one set of sales to make a definitive statement, especially when those results are all over the map. My personal impression is that Impressionist and Modern markets are pretty healthy and the results of these sales are a clear statement that it is all about the specific works being offered. When the right piece hits the market, it will garner a strong price and when an average work is offered, the result is just that … average. Gallery Updates: Keep in mind that our summer hours for the month of July are Monday - Thursday: 10 am - 5 pm. We will also be exhibiting at The Newport Antiques Show from the 25th - 27th ... a number of the works featured on our Recent Acquisitions pages will be on view. Web Site Updates: We are still pretty active and a number of works have passed through the gallery; among them were paintings by: Jules Breton, Victor Marais-Milton, Antoine Blanchard, John Stobart, Ken Salaz, Bart Walter, etc. In addition, we have added a number of new pieces to the web site by Wiggins, Graves, Boudin, Cortes, Toudouze, Rico y Ortega, Jahn, Bauer, Combes, Stobart, Suys, Walter, Salaz, Koeppel and Steel. Next Month: Hummm … we are working on ideas.